Cursor tracking that remembers and returns to the place where you left off in a note as well as efficient navigation by page, paragraph, line, word or character are just two of the numerous benefits that Android users who are visually impaired will get when they switch to AccessNote. 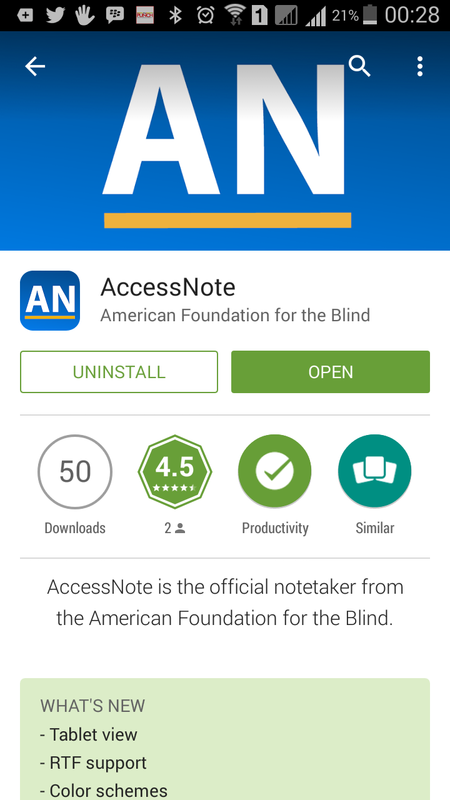 The notetaking app developed by the American Foundation for the Blind is targeted at users who rely on to fully use their smartphones and tablets. Many blind and visually impaired students and professionals will certainly recall their difficulty with jotting their thoughts, ideas and observations whether those come up in school, at work, at play, in a religious gathering, at a conference or in just about any other place. For sighted persons, realising this can be just as easy as pulling out a pen to scribble on the flip side of a just-consumed bubble gum wrapper. And in the age of smart devices, taking notes has never been so easy for sighted persons; with numerous apps available in virtual stores free of charge or for just a few dollars, the choices and possibilities for this category of persons are limitless. Except for a few, majority of the popular notetaking apps offer very little functionality that made them useable by persons who are blind or visually impaired. The American Foundation for the Blind promises to turn the narrative around with the availability of its . The notetaker is currently free to install from the Play Store and is compatible with devices running Android 4.2 and up. With AccessNote, users will be able to combine “efficient note taking” with the other features and functions of the Android devices, says the app developer. Accordingly, blind and visually impaired people can now take full advantage of the same popular mobile devices that their sighted peers are using in classroom or business settings. • Two powerful search features for finding text globally across all notes and within a note. • Cursor tracking that always keeps your place when you return to a note. • Keystroke efficiency – Less keystrokes to get the job done. • Fast and efficient navigation throughout a note by page, paragraph, line, word, character, and other elements. As with all apps, there are bound to be bugs just as users may want to request for additional features. Whichever of these you want to do, just get in touch with the app developer by sending an e-mail to accessnote@afb.net. Before July 2014 when version 1.0 of AccessNote became available in the Playstore, the The Android release was made possible through a grant from the Motorola Foundation.